Staple some envelopes together to make a booklet with “pockets” to place Valentine gift vouchers. Great idea for Father’s Day, Mother’s Day, and Grandparent’s Day as well. Students come up with ideas for helping around the house, then design the voucher, placing each in a specially-designed pocket in this thoughtful booklet to be given to a lucky recipient on a special day. What a thoughtful gift, from the heart! making thoughtful, inexpensive gift for mom, dad, grandparents, etc. at least 4 envelopes per student, re-use old envelopes by cutting off the top and cutting a V-opening (see photo) on back side of envelope where the voucher will go in (back of envelopes face front for booklet). You can also reuse envelopes from junk mail or monthly billings (cut off tops so they can’t be sealed). ***Fold left side over 1/2″ so that student’s remember not to use this margin which will be stapled. 4 1/4″ X 9″ scrap colored cardboard front and back cover pages, two for each student (re-use bristolboard scraps); ***Fold left side over 1/2″ so that student’s don’t use this margin, which will be stapled. Before lesson, cut off tops of all envelopes, so they cannot be sealed shut. Hand out at least 4 envelopes and 4 slips of paper to each student, plus a cardboard cover page. ***Tell students that the folded side goes on the LEFT side and not to print in that small area because it will be stapled shut; this is where their booklet will be joined together. Tell students we will be making gift vouchers for mom or dad or grandma and grandpa. Brainstorm ideas of things students are willing to do to help out around the house. See Voucher Idea Lists below (for younger and older students). Ideas must be appropriate for student’s age, both in duration and difficulty, always keeping safety in mind. Students neatly print their voucher, then place inside an envelope. The envelope will ask a question and the voucher will provide a solution (not quite an answer). Explain the difference. Vouchers and envelopes may be decorated. 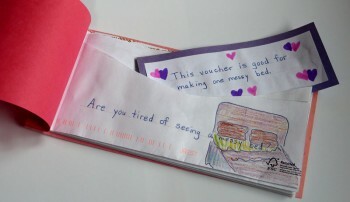 The outside of the envelope might say….”Are you tired of seeing a messy bed?” Inside, the voucher would say “This voucher is good for making one messy bed.” (The answer to the question is “yes” or “no”.) Other questions might be: Is the grass getting long? Do you have a dirty car? Would you like someone to make you breakfast? Questions can be printed on the chart board for younger students to copy. The class needs to brainstorm ideas for the cover of their booklet. Each student may print their own version. The cover of the Susan’s voucher booklet might say: Grandma’s Valentine Vouchers, lovingly supplied by Susan. Peter’s booklet might say: Dad’s Valentine’s Day Voucher Booklet, specially made by Peter. See Booklet Titles below. When all vouchers, envelopes, and cover page are complete, teacher staples pages together, checking work for spelling and neatness. Grandma’s Valentine Vouchers Lovingly supplied by Susan. Dad’s Valentine’s Day Voucher Booklet Specially made by Peter. 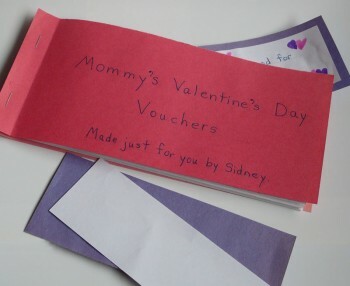 Mommy’s Valentine Vouchers Made just for you by Sidney. Special Valentine Day Gift Vouchers Created by Brandon.